Has anyone here made any? I'm just curious because i'm in the process of buying a few Rorschach customs I've found here and there, and I find it interesting that no official action figures were made until now. The DC direct figures look really good, but I was sort of hoping I wouldn't have to go to a comic book shop in order to buy them. But it's not too bad, at least we are getting official figures. Also, why was the comic line cancelled? 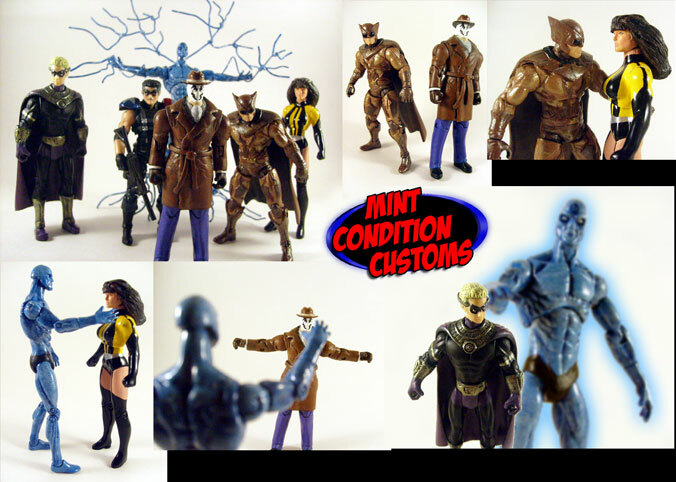 Post subject: Re: Watchmen Customs? I'm working on a custom Rorschach 12" figure with a friend of mine. I should have pics soon. The original DC Direct figure line in 2000 was canceled because Alan Moore did not approve and at the time DC was trying to not rock the boat. "It's a joke. It's all a joke..."
To give you a sense of scale, it's about 2 feet high and 3 feet long (24" x 36"). That's a fantastic background there! Especially love the Hiroshima lovers. What kind of material are you going to be using Carl? The only thing that would make your backdrop better is if the "WWTW?" graffiti were partially obscured by something, like it always is in the book. Maybe you could stick a Nixon re-election poster or Pale Horse handbill over the "-EN?" part, or maybe it could just be half-done as though Rorschach tackled the graffiti-ist before they could finish the tag. But still, bravo! "The light is taking me to pieces, and I'm afraid I just blue myself." Yeah that looks very good Carl. I've decided to do a custom Rorschach as well, using a Movie Masters Joker as a base. Now I just need to find a Trenchcoat that will work. Hurm... that's a good idea indeed! I'll think of something. It's still not finished. I have been kicking around the making of a custom Comedian figurem but do not know where to begin, mosty because I work at a toys-r-us and looking at the gi joe figures eveyday it out. Of couse thats only a lauching pad into making a Comedian costume for myself but I digress. I picked up an extra Justice Leauge Unlimited figure of the Question. I might turn it into a Rorschach. You can watch the world devoured in it's pain "
Ya know, that would be a really good idea, I saw that someone on FigureRealm made a custom Rorschach out a Question. 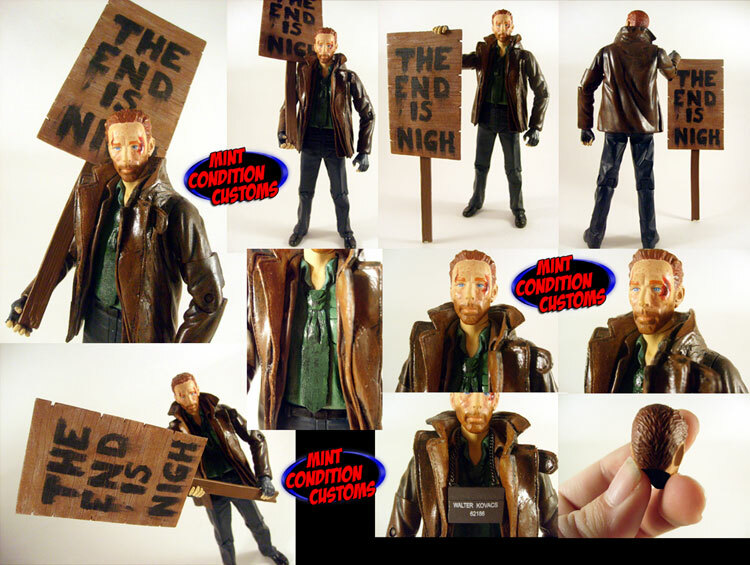 I saw that someone on FigureRealm made a custom Rorschach out a Question. Note: All of the customs shown here are currently up for auction on eBay. You can find them by searching eBay. I personally made a custom 6 inch Walter Kovacs that is in the same scale as the DC Direct Rorschach figure they made for the movie. A full description can be found here on my site. The sign is made from a foam sheet that I cut out in the shape and took my hobby knife to it. It's my favorite part of the entire figure. I also did an entire set of 3.75 inch Watchmen customs. Full descriptions and photos of each custom can be found here. Location: The Gemini sector, tooling around the space lanes of the frontier. Who Washes The Washmen's Infinite Secrets of Legendary Crossover Knight Wars? "If you immediately know the candlelight is fire, the meal was cooked a long time ago." Once I get ahold of some paint and other supplies, I'll convert my Silver Surfer figure into Dr.Manhattan and my Superman figure into Ozymandias. And, I'll turn my Howard the Duck figure into a Rorduck figure. I felt the Comedian figures needed to be spiffed up!